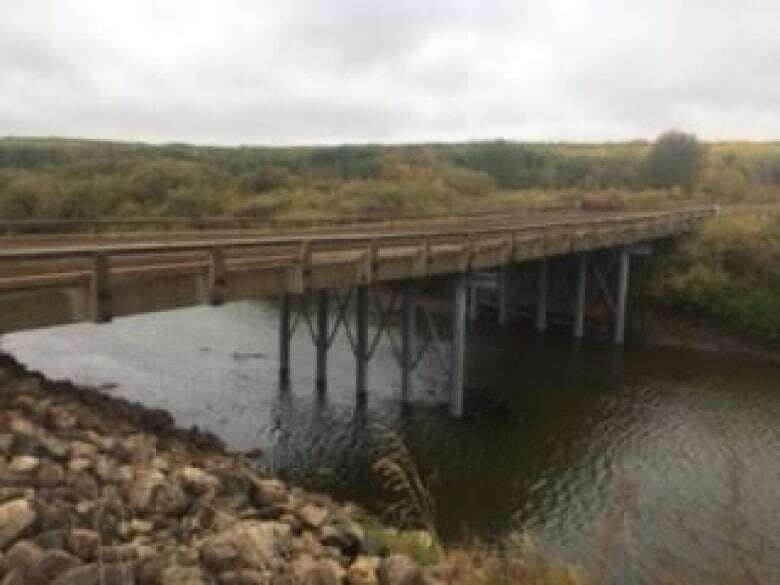 The Reeve of the rural municipality of Clayton says the bridge that collapsed six hours after it opened was built without having geotechnical investigation done on the riverbed it stood on. A bridge building expert calls that approach "irregular." 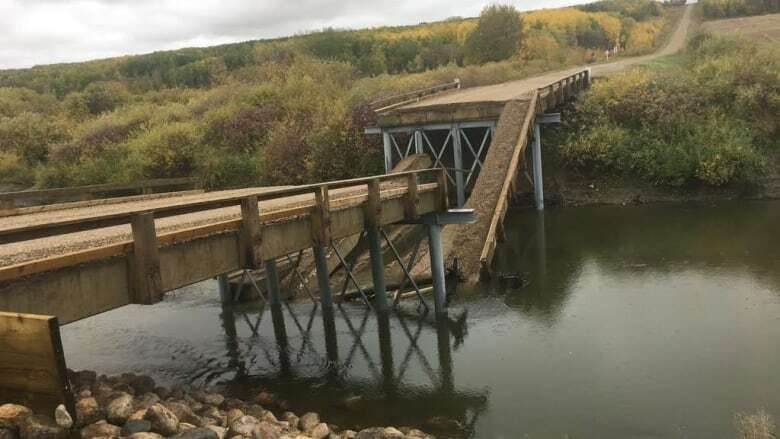 Bridge expert calls lack of geotechnical work "irregular"
The Reeve of the rural municipality (RM) of Clayton says the bridge that collapsed six hours after it opened was built without having geotechnical investigation done on the riverbed it stood on. A bridge building expert calls that approach "irregular." The Dyck Memorial Bridge, located in the RM of Clayton about 300 kilometres east of Saskatoon, collapsed Friday shortly after it was opened. RM of Clayton Reeve Duane Hicks told CBC he believes the contractor and engineer did everything right and this was an "act of God." "It seems like something under the riverbed let go and a row of pilings sunk," Hicks said. "I don't know who to blame but I figure God built most of this for us." He said the issue was with five underwater pilings and "the whole five of them just went straight down. Boom. Four feet." "So something tells me that something underneath the ground happened. I don't know what it was. They don't know what it was. Nobody knows what it is." Hicks said a geotechnical study of the riverbed wasn't done before the bridge was built. Inertia, the engineering company for the project, declined to answer media questions and referred calls to the RM. Initially, Hicks told CBC the geotech work wasn't done because it's not possible to do that work under the river. "You can't drill through water," he said. "You can't do it. You can't take underground samples." He said people in the industry he spoke to told him standard practice was to drill holes on each shore and assume the soil under the river would be the same. "All the bridge people that we've talked to since this has happened indicate that's what they do," said Hicks. He said he is not sure if Inertia did drill holes on the shore when building the Dyck Memorial bridge. Paul Gauvreau, a bridge-building expert from the University of Toronto, disputes Hicks's claim. "I think it's irregular that a proper geotechnical program wasn't done for the piers in the water," said Gauvreau, an engineering professor at the U of T. "And it is not correct to say that it can't be done in a river. It's done all the time." He said that is even the case for a small bridge like the one in the RM of Clayton. "Perhaps for smaller bridges you can get by with a less extensive geotechnical program, but generally speaking you're going to have at least one test hole at the location of every pier including piers in the water," he said. Later in the interview, Hicks acknowledged that perhaps drilling can be done under the riverbed, but said it would be costly. "Well the fact of the matter is we don't have a heck of a lot of money," said Hicks. According to Sasktenders, the bridge contract was worth $325,000. Hicks said it's difficult to justify a huge budget for this bridge, which he estimated would have about 1,000 vehicles crossing it annually. Gauvreau also disputed Hick's claim about the cost of this work. "A geotechnical investigation relative to the cost to build a bridge is not that expensive. It's being sort of penny-wise and pound-foolish by not doing the geotechnical investigation," he said. Furthermore, he said making this sort of decision based on cost is not appropriate. "It's not an insignificant cost but the point is that's not a cost that you can shave," Gauvreau said. New bridge in three to four weeks? Hicks said he'd like to see the new bridge completed within the next three to four weeks, though he acknowledges that may not be realistic. He said the construction company is going to rebuild the bridge at no cost to taxpayers. Hicks said the company will be going to extraordinary lengths to ensure the piles are solid and immovable. "They're going to go down deeper. And just keep going down and down and down," he said. "I don't know what I could ask them to do differently quite frankly." Hicks says the Association of Professional Engineers and Geoscientists of Saskatchewan (APEGS) is conducting an investigation. APEGS executive director Bob McDonald refused to confirm or deny that. 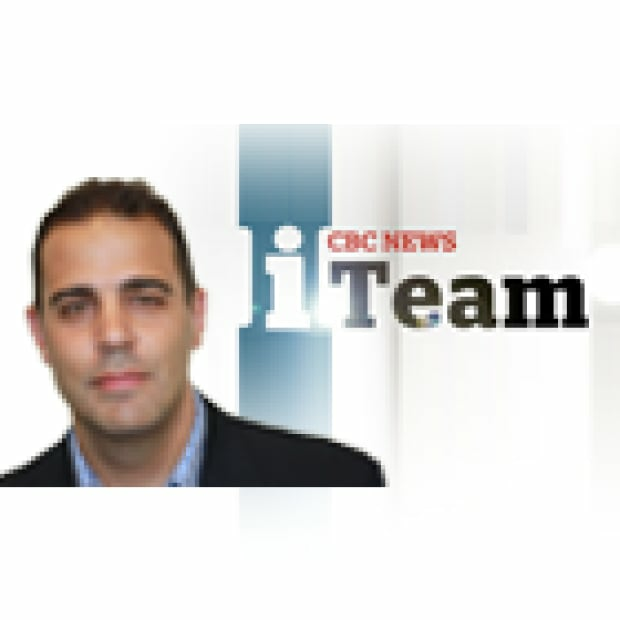 McDonald did tell CBC the organization can only investigate if it receives a complaint or a request by the organization's council. He said the only way the organization would ever confirm an investigation had been conducted is if it found professional misconduct or incompetence.